The Developer Tab in Microsoft Office 2007 & 2010 enables users to access the powerful Visual Basic & Macro tools as well as Spreadsheet form & ActiveX controls. Many of the examples for integrating our products with Microsoft Office Applications require accessing the VBA project window and occasionally inserting buttons and controls onto your spreadsheets. 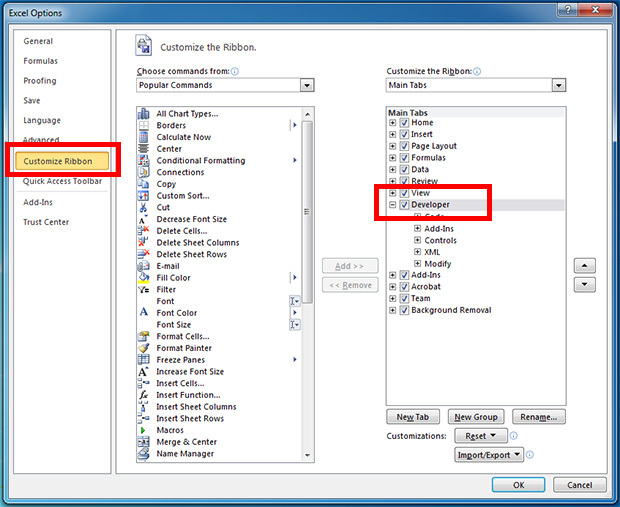 To enable the developer Tab in Excel 2010, click on the File menu and select "Options" at the end of the menu. In the new window that pops up, click on "Customize Ribbon" and check the option labeled "Developer" on the right hand pane. Click OK.
Now, examine the tabs on the ribbon interface. You should have a tab labeled "Developer". Click on this tab to access the Visual Basic window, as well access all of the buttons and controls you may need.